Revenge of the Sith merchandise launches! Now that April 2nd has come and gone, all the new merchandise promoting Revenge of the Sith are flooding retailers everywhere. Many stores had special events happening at midnight of April 2nd, offering fans the new toys at the earliest possible time. Being an employee in a grocery store, I can't help but notice all the Star Wars pictures, quotes and logos being printed onto cereal and cracker boxes. It's where Lucasfilm makes a huge portion of their money, and they've been doing it since the original Star Wars: A New Hope was released in 1977. Since the launch of ANH in 1977, Star Wars merchandise has sold more than $9 billion, worldwide. Some of the popular ROTS accessories include the usual array of action figures, toy light sabers that change colors or make sounds, a Trivial Pursuit Star Wars Saga Edition Game, and an interactive foot-tall Yoda doll who moves and talks. 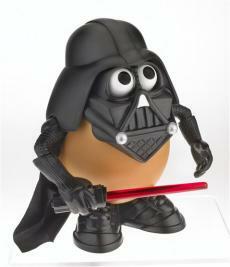 But you can't forget Darth Tater, the Mr. Potato head dressed up like Darth Vader. Now, I'm not writing this article to promote the new Star Wars stuff or to just update you on the latest Star Wars news like most of your news sources have probably done upon the launch of all this Star Wars merchandise. 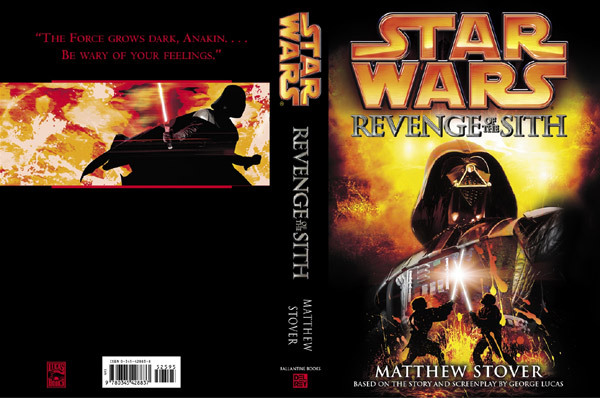 I'm writing this article about the novel based on the screen play of Revenge of the Sith. The book was also released on April 2nd, and it offers the story of this upcoming Star Wars film packed into a hardcover book written by Matthew Stover. There are two types of Star Wars fans, ones who will read the novel before seeing the movie, and ones who will read the novel after seeing the movie. Of course, there's always the fans that don't read the books at all. Nothing against you guys since I'm not much of a reader myself, you just don't fall into the audience I'm writing this article to. Anyways, both types of fans have their reasons why they read the novel before or after the movie, but I too, have my own opinions. I was very tempted to go out and buy the novel, because I'm so anxious to find out what happens in the story. But I decided not to spoil the story and save the suprises for the movie. Then I'll read the novel after I see the movie to help clear up some questions I may have about the story. For example, in Attack of the Clones, one of the most suprising parts in the movie (for me atleast) was when Jango Fett was killed by Mace Windu. Mace just ran towards him deflecting off every laser bolt with ease until he got close enough and sliced Jango's head off with one swing as Jango had starting to back pedal. I really didn't expect Jango to be killed so fast, because he put up so much of a fight against Obi-Wan. Right when Jango's head flew off I said "Whoa..." out loud in the theater. It's suprises like this that make the storyline and plot exciting in a movie. Had I read the book before, I would've seen this coming and not enjoyed the suprise. As for Revenge of the Sith, we all know what's going to happen in the movie. Anakin becomes Darth Vader, all the Jedi are killed off except for Yoda and Obi-Wan, and Luke and Leia are born. But it's the specific little events that make this story come together that we are unsure about. You can find out these little events and tid bits of the story by reading the book or watching the movie. I just wanna encourage all the Star Wars fans out there to see the movie first and then read the novel. I know how tempting it is to read it before and I struggled with this myself, but I really wanna enjoy the movie to the fullest and be surprised. But you can always read the book first and spoil the exciting parts of ROTS if you want. Gut it out! The movie will be out eventually!